If you know me, you know I love AirBnb's. Seriously, I not only use AirBnbs for accommodation, I use it to research new destinations, meet people, and better connect with the culture when I travel. Over the past few years, I've stayed at over 19 AirBnb's and see no end in sight! Ok, I'll start with one of my absolute favorites! Coined "Totem Terrace" - this beautiful abode lies in the hills of Topanga, California. Topanga is known for its majestic mountains, beaches, and eclectic hippy culture. Just 15-20mins north of Santa Monica and you are in a true paradise! Tips: Ask the host for the dirctions to a secret hiking trail that is unbelievable at sunset. Notes: This has a "glamping" type feel so if you come during the winter months bring extra jackets. Also, the toilet is a compost so a little different, but for me, it was all part of the experience! *Bonus* - Check out the other listings on Lydia's incredible property. I also got to do a cute little couples session here with The Travallure and Roman! I can't say enough good things about this place. It truly has a magical vibrance to the land. Not to mention Hollie and and Bryan go out of their way to make you feel at home while allowing you enough privacy to completely relax. Tips: You must try the restaurant down the street, The Old Place. It has such a cosy feel, lively vibe, and delicious food! 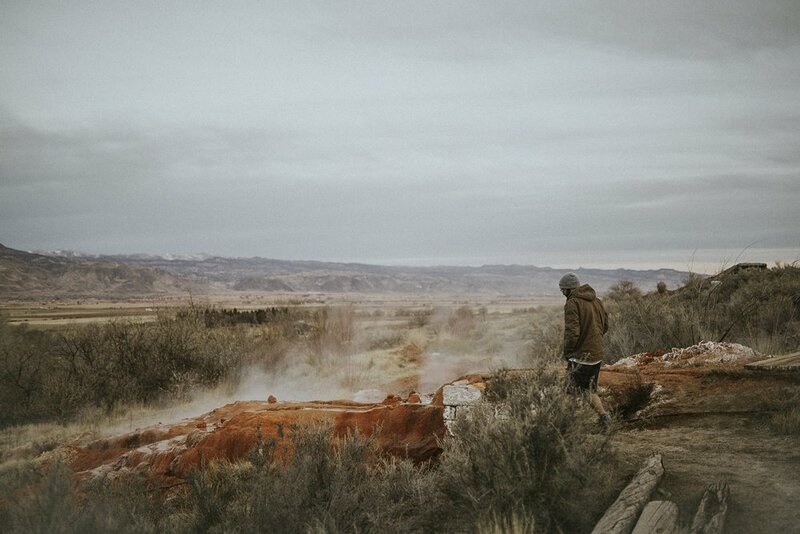 Almost directly between Colorado and California, Mystic Hot Springs in Utah is an incredibly relaxing stop on your way to the Pacific. I am a sucker for more natural style hot springs (rather than pools) and Mystic Hot Springs is exactly that. The natural spring water drips down the mountain into rustic bathtubs that look over the mountains and valley. What more could you ask for?! Tips: Wake up at sunrise for some perfect light. Notes: The busses were a little on the rustic side, but had everything we needed to stay warm on our stop over. If you are looking for something more romantic I would look into booking their cabin options. While I love the teepee style and cosy fire place at this listing, this one is mainly on here because of it's access to nature, trails, and the cute town of Packwood, WA. Tips: Check out this amazing hike, Silver Falls Loop. Notes: The Airbnb is a little close to the owners home which makes it feel a bit less "secluded". However, after a long hike we just needed a warm fire place, nice shower, and comfy bed and we were happy! READ REVIEWS - Yes, do a bit of digging in the reviews section. Sometimes the reviews might reveal that the place is a little too "rustic" or that there are loud birds near by. You also might learn that the hosts are awesome, or that there is a cool coffee shop around the corner. After photos, reviews are my first stop to learn more about the property - good and bad. WARNING SIGNS - If you see a listing with little to no reviews, just know you are taking a bit of a gamble. This could mean the price is lower and you get to stay in an awesome place for cheaper or it could mean that there are issues that they are not showing in the photos. I've only done this a few times and never had a problem, but it is a little gamble! If you don't already have an account, use my referral code to get $40 off.